An initiative started on the fiftieth anniversary of the Boutique Hotel Ilio, when Maurizio Testa decided to produce a wine, together with some of the cellars on the island, which was to be a symbol of Elba itself, combining together in a single glass the perfumes, sensations and flavours most typical of the island. 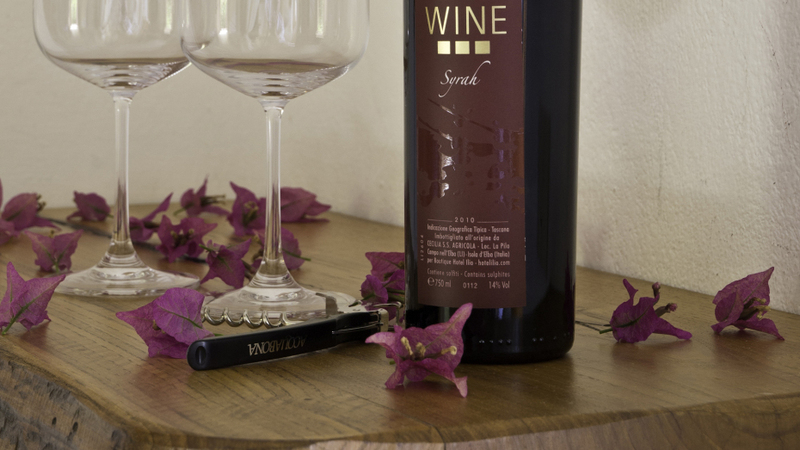 Thus the first Hi Wine Ilio 50 (Elba Red Reserve DOC 2004) was created, and the passion for creating, producing and following new and original brands has continued. The latest jewel is Hi Wine (indicazione geografica tipica Tuscany 2010), ruby red in colour with traces of purple, clear and at the same time consistent, like the sea at sunset. The aroma is intense with marked hints of mature blueberries and blackberries, characterised by spices, a hint of toasting, coffee, chocolate and graphite. The result is a warm and embracing wine, very elegant and persistent. Made with Syrah grapes, the fruit of red chalk and clay soils, ideal for accompanying Tuscan meats and mature cheeses during the most beautiful hours of the day: at sunset.